It’s been said that Denton resident’s are fundamentalist for opposing natural gas power plant(s) in town when Austin, the most progressive city in Texas, is planning on using a natural gas power plant. Austin’s air reality is dramatically different from Denton’s air reality so this is not an apples to apples comparison. Residents of Denton have requested a systematic evaluation of air impacts from the proposed natural gas power plant(s). Why is the city refusing to grant residents this request? Below are graphs compiled from TCEQ air monitoring station data by Mahdi Ahmadi. 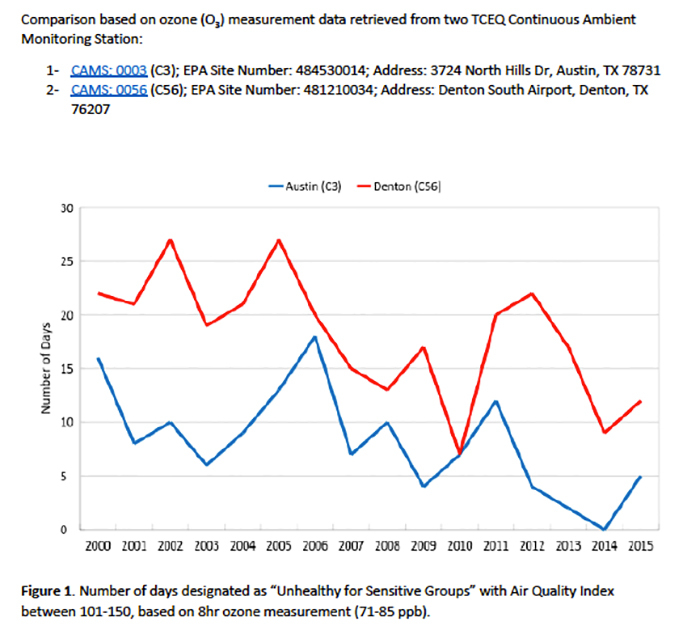 These graphs compare current and past air quality realities in Austin and Denton. Even if Austin’s decision to invest in gas power plant is justified, it is not that straightforward to copy them here in Denton. Here is the simple reason: air quality in Denton has been much worse than in Austin, despite Denton being a much smaller city with significantly less traffic. Air quality based on ozone is much worse in Denton. A comparison of volatile organic compound VOC data should also be made. On December 15, 2015, the Denton City Council had a public hearing on DME’s “Renewable Denton” plan. Only two people spoke in favor of the natural gas power plants. Mahdi Ahmadi spoke at 7:26. Here is a loose transcript of his comments with some direct quotes in parenthesis. I urge you to listen to his entire presentation, which is only about 5 minutes with questions. We ran different simulations, we had 17 different scenarios. Kevin Roden brings hypothetical case where all cities were going to 70% like Denton. Would that help Denton’s air? My comment: 1ppb reduction is not much.